^ Meisheri IV, Motiwale SS, Sawant VV. Surgical management of enlarged prostatic utricle. Pediatr. Surg. Int. 2000, 16 (3): 199–203. PMID 10786981. doi:10.1007/s003830050722. ^ Lopatina OA, Berry TT, Spottswood SE. Giant prostatic utricle (utriculus masculinis): diagnostic imaging and surgical implications. Pediatr Radiol. 2004, 34 (2): 156–9. PMID 12961046. doi:10.1007/s00247-003-1048-9. 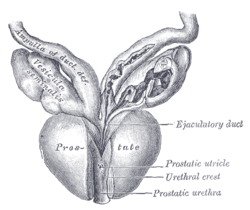 SUNY Labs（英语：SUNY Downstate Medical Center） 44:05-0204—"The Male Pelvis: The Prostate Gland"